Today we look back at the very first fish ever submitted to the “Top 5” project. 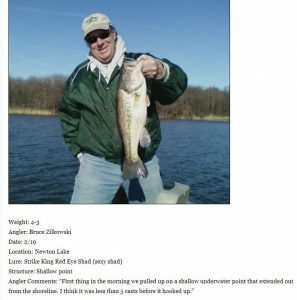 Pictured above is angler, Bruce Zilkowski, along with the details on his bass from the entry for the catch. And it all started after a conversation with one of Bruce’s friends, Terry Isbell. Now I had long compiled a list of my Top 5 bass catches for each outing but I sure hadn’t thought about keeping a tally of my annual five best bass. How that escaped me I have no idea but I was on board one hundred percent with the concept. So, in 2014 at a former blogging gig I kicked off the “Top 5”, a sort of virtual brag board. Kind of the modern day equivalent to the stack of pictures that I used to marvel over at a pair of local baitshops, Al’s Sporting Goods and Steve’s Army Surplus. Oh, what a collection of catches those shops used to hold. Anglers of all ages and interests adorned the counters with all manner of species and sizes. A strip mine bass here, a Lake Storey muskie there, a hand-sized farm pond bluegill, a stringer of Oak Run crappie, some Spoon River catfish deeper in the stack or a stray Lake Bracken carp slid across the glass amongst a handful of other photos. Various handwritten details adorned the backs providing yet more to amaze this young angler. Well, it’s all still part of the fun of the Top 5 project which has included anglers from age 8 to age 80 and has expanded to include various species as well. Regular Monday updates when the catching is good grace the blog along with monthly and yearly updates of the stats we amass. A sample of those initial 2014 bass and their anglers. And we’re doing it all once again in year number six that kicked off with a New Year’s Day bass nabbed before winter got all ugly around here. But it’s mid-February and pitchers and catchers have begun reporting which brings a faint glimmer of hope that my least favorite season will eventually loosen its grip.